Knowledge is the key to making smart home renovation decisions. Bamboo floors come in a variety of construction and installation types, each with their own unique set of benefits. 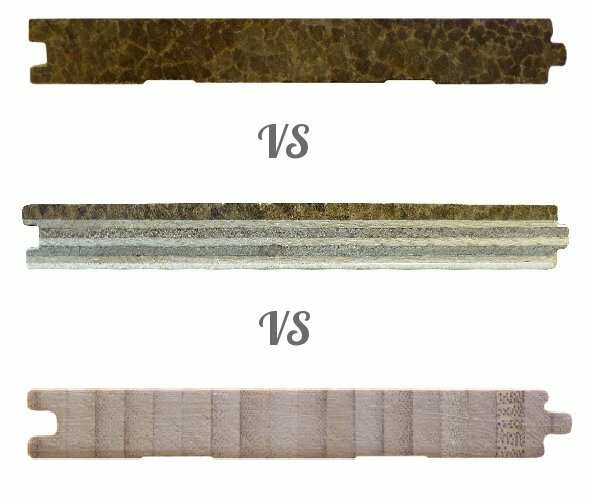 We hope our engineered bamboo flooring pros and cons guide helps you determine what bamboo wood flooring type is best for you. The 5 main types of bamboo flooring are: solid strand bamboo, solid strand "floating" bamboo, tongue and groove engineered bamboo, click-lock engineered bamboo, and solid horizontal and vertical bamboo. Familiarizing yourself with the different types of bamboo flooring construction ensures that you'll choose the right style for every project and that you won't experience problems with your installation. If you're looking for durability, we recommend strand woven bamboo, if you're looking for ease of installation, check out floating bamboo floors. Further information about engineered bamboo flooring’s pros and cons is listed below. If you have any questions about the different types of bamboo flooring, don’t hesitate to get in touch with us. Bottom Line: The perfect combination of toughness, beauty, eco-friendliness and affordability. Can be nailed down or glued down (even on concrete) and there are no run limits. Holds up great against pets and children, can be used in kitchens, and is available in premium wide planks at a fraction of what you'd pay for traditional hardwoods. **Opening the windows in your home for a full day is okay. Bottom Line: Floating solid (wood all the way through) wood floors generate a lot of complaints about shrinkage, as these floors should only be installed in homes with very stable humidity. If you want a floating floor we strongly recommend using an engineered bamboo floor (not solid) as engineered floors have much higher dimensional stability and aren't nearly as susceptible to humidity variation. Bottom Line: If you want to float a hardwood floor, engineered click lock bamboo is the way to go - it's tough, beautiful and easy to install. We recommend choosing an engineered floor with a minimum 2mm wear layer (can be refinished twice) and a high quality 3 in 1 underlayment that has a high STC sound rating - this will result in a final product that looks and feels exactly like solid hardwood when you walk on it. Bottom Line: Similar to the click lock engineered bamboo floors mentioned above, this tongue and groove version is very stable for floating installations. The downside as a floating floor is that they're a bit harder to install as you have to manually apply the bead of glue along the inside of the grooves of each plank. Can also be nailed down or glued down. Bottom Line: If you like modern looking floors, these are for you. However these floors are not intended for use in high traffic environments. From a hardness perspective they're just mid-range, more similar to Red Oak than to strand woven bamboo, which means these floors are more susceptible to showing dents and scratches over time. Ambient has been shipping only the highest quality bamboo flooring direct nationwide since 2005. We specialize in eco-friendly, durable, safe and high-quality bamboo and eucalyptus hardwood floors. We dedicate ourselves to providing beautiful bamboo floors at reasonable prices that are safe for you and your family, with personal and professional service to boot. We take a unique "can do" approach to our business, which has grown rapidly; we ship our products direct to every corner of the United States as well as internationally. Our flooring is used by major architects and builders across the world and has been used all over the United States, and also in locations as far off as Kenya, France, Bahrain, Kuwait, Mexico, Guam and many others. Homeowners and flooring professionals alike rely on Ambient to provide bamboo floors that won't shrink, buckle, peel or warp like other brands. Every Ambient flooring order all comes from the same lot - so you don't get shade patches in your floor. Furthermore, each of our samples has its lot number written on the back - just mention that lot number when ordering, and presto - your flooring order will come from that exact lot, so you know that your final floor will match your sample. Every single Ambient floor meets the strictest indoor air emissions standard in the world: CARB Phase II. We take your health very seriously, as if it were our own - that is why many of our employees and their families have our floors in their homes. We stock matching trim, moldings, and installation materials for our floors. We can you assure you that we have the bamboo wood flooring type that will get you compliments for years to come.